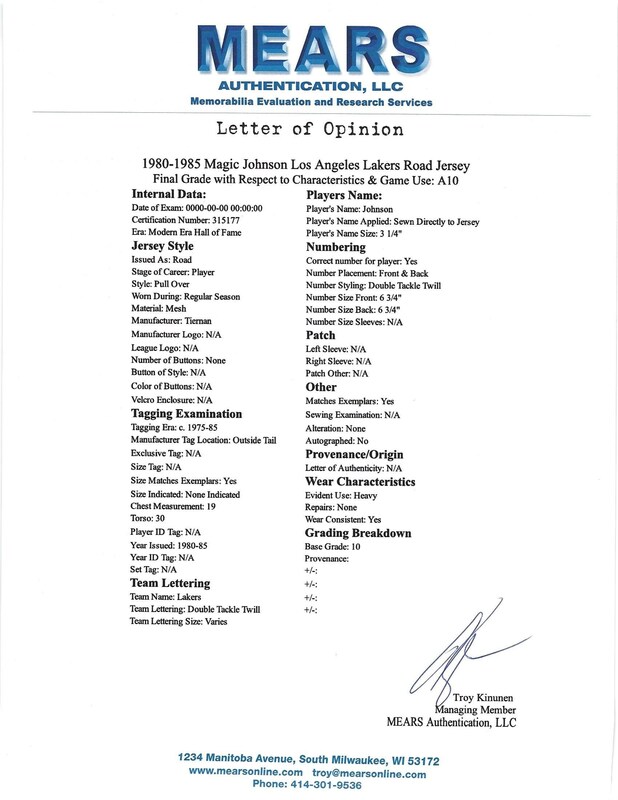 No NBA player enjoyed a more bountiful decade during the 1980s than Earvin "Magic" Johnson. As the Los Angeles Lakers playmaking point guard, the 6' 9" master of the no-look pass took the "Lake Show" to heights even they had not seen before. Fresh off his 1979 NCAA Championship with Michigan State, Johnson landed in L.A. as the NBA Draft's No. 1 overall pick. He wasted no time in transforming the Lakers back into championship form as he led the team to the NBA title as a rookie. 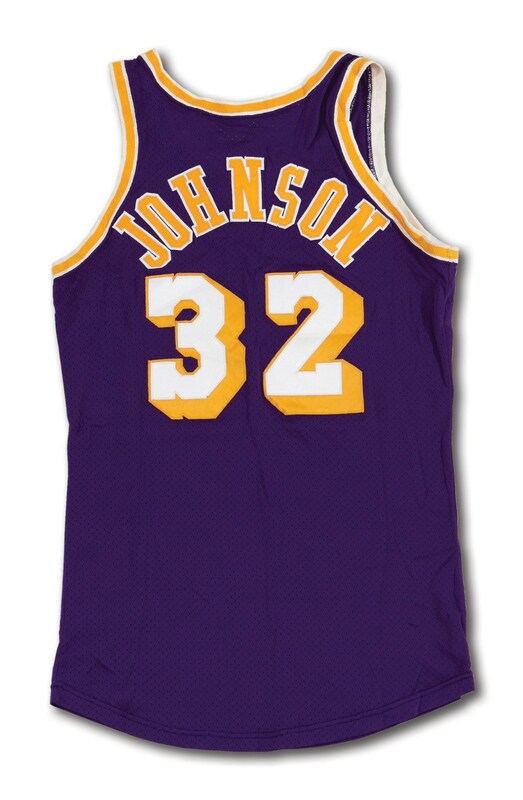 In fact, in the clinching Game 6 of the 1980 NBA Finals, Johnson started at center in place of an injured Kareem Abdul-Jabbar and scored a game-high 42 points and 15 rebounds to nearly single-handedly defeat the Philadelphia 76ers. Magic's light only got brighter from there. 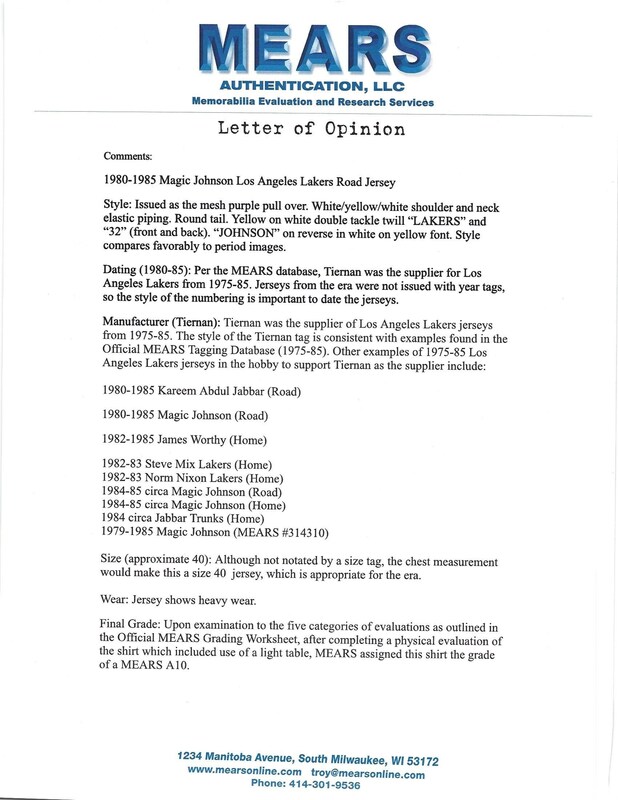 The early part of the decade set the stage for what would become Lakers' basketball dominance for the next 10 years. 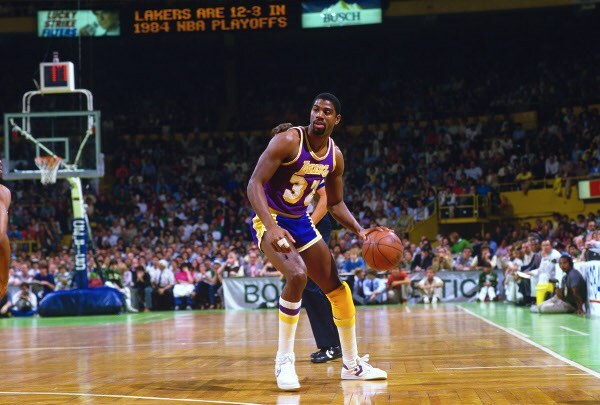 Two of his NBA titles and two of his NBA Finals MVP awards occurred in 1980 and '82. 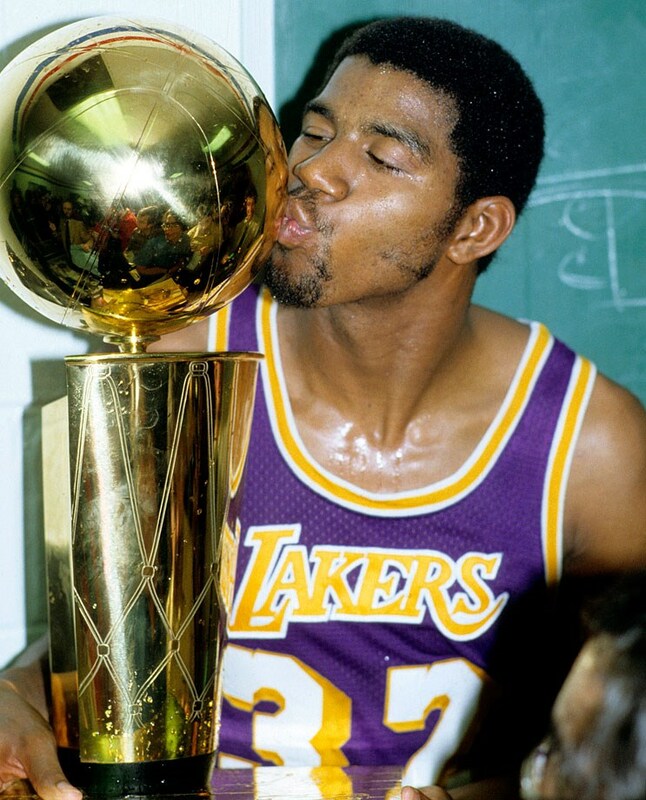 Johnson's infectious smile and incredible playmaking skills kept the Lakers at the top of their game as they would go on to win three more NBA championships over the next six years. Offered here is an early 1980's (circa 1980-85 according to MEARS) Magic Johnson Los Angeles Lakers game-worn road jersey with incredible provenance. 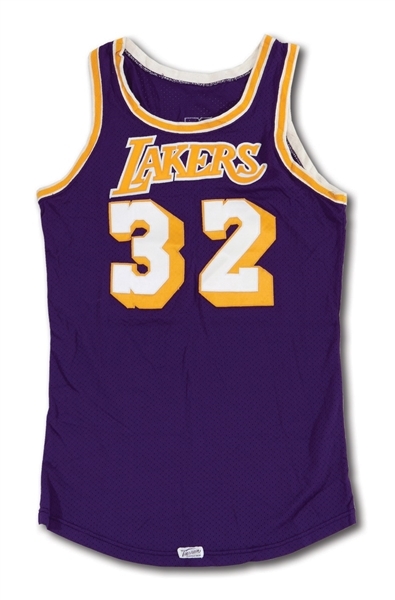 Constructed of road purple mesh, the coveted jersey reads "Lakers" across the front in yellow on white tackle twill as well as Johnson's trademark uniform number "32" in white on yellow tackle twill. 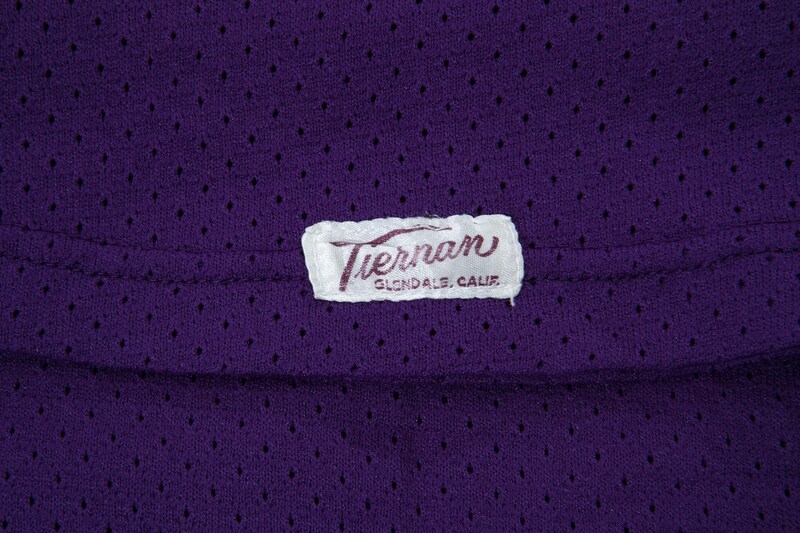 The front center tail boasts the proper "Tiernan" manufacturer's label that populated Lakers jerseys during Johnson's first seven seasons of pro basketball, which means this particular jersey very well could link to Magic's world championship rookie season of 1979-80. The back of the jersey reads "JOHNSON" in semi-circular fashion across the shoulders in yellow on white tackle twill, with his number "32" positioned below it in white on yellow tackle twill. 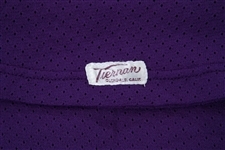 All numbering and lettering are sewn directly onto the purple mesh jersey, which reflects moderate game use. Worn by one of the greatest showman in NBA history, this lot represents a must-have for any true Los Angeles Lakers collector! Letter from MEARS with perfect A10 grade. Provenance: This lot originates from a gentleman who has enjoyed a long and successful career in Hollywood as an agent for many well-known athletes and entertainers. His professional and personal network enabled him to amass a significant collection of memorabilia, nearly all of which was given to him directly from the athletes and entertainers themselves. All of these items are being introduced to the marketplace here for the first time. While our consignor remains anonymous, SCP Auctions will issue an LOA for each game used item attesting to its player-direct provenance. Auction closed on Saturday, January 21, 2017.